The concentration of a solution represents how strong or weak it is. For everyday purposes, you express concentration as a percentage--at the drug store, for example, you can buy 35 percent rubbing alcohol. In chemistry, however, you usually express concentration in terms of "molarity"--"moles" of solute per liter of water. Once you know a solution's starting molarity--its "initial concentration"--you can use a simple equation to calculate what its molarity would become if you diluted it to a certain volume--its "final concentration." Convert your grams of solute into moles, keeping in mind that one mole of a substance is equal to its molecular mass (in atomic mass units, "amu") represented in grams. As an example, consider a 124.5 grams of calcium carbonate, CaCO3. Per the periodic table, calcium carbonate's molecular mass is 100.09 amu, which means its "molar mass" is 100.09 grams. Calculate moles using the following conversion factor: 124g CaCO3 X (1 mol CaCO3/100.09 g CaCO3) = 1.24 mol CaCO3. Calculate molarity--moles of solute per liter of solvent. For example, imagine you wish to dissolve the 124.5 grams of CaCO3 in two liters of water. 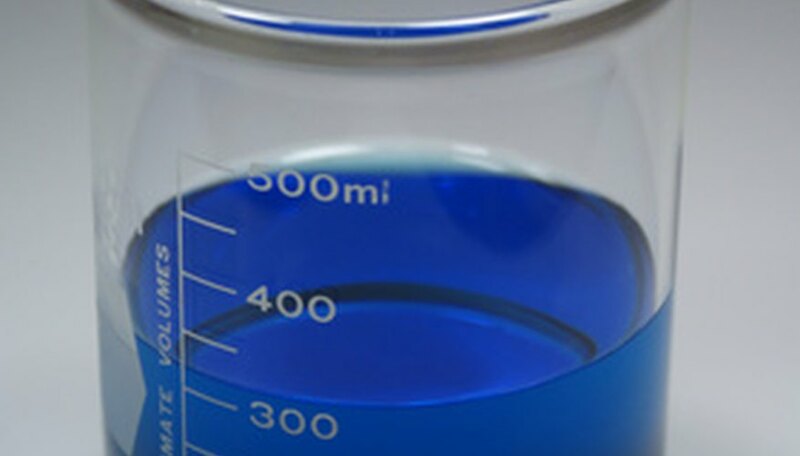 Divide your moles of solute by liters of solvent--in this case, water--to figure molarity. 124.5 grams of calcium carbonate--1.24 mol CaCO3--dissolved in two liters of water has a concentration of .62 moles per liter, or .62 M.
Plug your values into the "Dilution Equation," Ci x Vi = Cf x Vf, where "C" and "V" represent "concentration" (in moles per liter) and "volume" (in liters) and "i" and "f" represent "initial" and "final," respectively. Imagine you want to dilute your calcium carbonate solution to a volume of 3.5 liters. In this case, (.62)(2) = (Cf)(3.5), 1.24 = 3.5(Cf) and 1.24/3.5 = Cf. The final concentration, therefore, is equal to .35 M.
Use the periodic table to calculate molecular masses by adding the atomic weights of all the atoms in your compound. For example, water--H2O--contains two hydrogens and one oxygen, each hydrogen weighing 1.00 amu and oxygen weighing 16.00 amu. Water, thus, has a molecular mass of 18.00 amu. Schrader, Robert. "How to Calculate Final Concentrations." Sciencing, https://sciencing.com/calculate-final-concentrations-6949338.html. 24 April 2017.